Lush greenery rich in Douglas fir and hemlock trees covers the Triangle Lake valley of the Oregon Coast Range. Today, however, geologists across the country are more focused on sediment samples dating back 50,000 years that were dug up by University of Oregon scientists. The sediment provides a fresh perspective on the region, which was not touched by glaciers during the last ice age. It was a frost-covered grassy landscape that had erosion rates 2.5 higher than what is experienced today. A frost-cracking process, rather than rainfall, likely drove the rapid erosion. The research, which is detailed in the Nov. 27 issue of the journal Science, carries repercussions far beyond the research site near Little Lake, just 40 miles northwest of Eugene. It is possible that non-glaciated terrain across North America was similar, with mean annual temperatures of up to 18 degrees Fahrenheit cooler than modern temperatures. 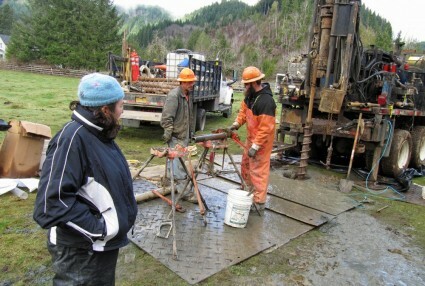 Core samples containing telling signatures of frost were drilled up from 200 feet below today's surface. The valley, also home to the much larger Triangle Lake, is the result of a massive landslide 50,000 years ago. Eroding sediment then continued to fill a large lake and transform the valley floor, allowing for the growth of vegetation that today prevents rapid erosion. UO doctoral student Jill A. Marshall led the National Science Foundation-funded research under the direction of Joshua J. Roering, a professor in the UO Department of Geological Sciences. 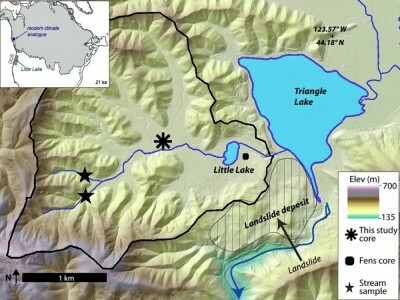 "I remember running into Josh's office and interrupting him to exclaim with great excitement, 'frost cracking — all of the paleo-ecological data suggests it had to be cold enough at Little Lake for frost cracking,'" said Marshall, now an NSF-supported postdoctoral researcher at the University of California, Berkeley. "And when the visual evidence in the core began to confirm our new hypothesis, it was exciting all over again." Materials in the cores showed "a transition from finely laminated red, brown and gray lacustrine clay, silt and sands to coarse lacustrine blue-gray sand deposits" at about 26,000 years ago. Lacustrine soils are those found in fresh-water areas. Subsequent analyses led by co-author Daniel Gavin, a professor in the UO geography department, found that the older sediment samples contained needles of both Sitka spruce and subalpine fir. This unusual combination of species, Gavin said, suggests a cold parkland setting characterized by patches of forest and open meadow such as that found in southeast Alaska today. The distribution of such frosty conditions, Roering said, may have stretched from Oregon to Georgia, and efforts to prove that are already under way. "Modern-day erosion and landscape change is slow compared to what it was during cold, dry climate intervals when there were no Douglas firs around and the hills were covered by grassy meadows," Roering said. "So using modern climate and geomorphic processes doesn’t help us understand how much of our surroundings were created. Rock properties, soil thicknesses, everything that makes the Coast Range grow trees today all may be benefiting from soils produced during that frosty period. This is a humbling discovery." The research team also included Patrick J. Bartlein (geography) and Alan W. Rempel (geological sciences), both of the UO, Darryl E. Granger of Purdue University, Sarah Praskievicz, a former doctoral student in Bartlein's lab now at the University of Alabama, and T.C. Hales, a former doctoral student in Roering's lab now at Cardiff University in the United Kingdom.